India being a diverse country and divided in many states which have cities within. Allahabad is a famous city in Uttar Pradesh and highly populated. The city has a lot of features which attract many to visit the city. The city is well established has a strong judicial arm the Allahabad high court is situated here. The court has long history and was launched in the year 1869 and has done a lot of prosecutions and fair judgments up to date. The court is among the first to be established in the Indian country. It has a lot attached to it, crucial cases and life changing verdicts have taken place in the Allahabad court. Allahabad has gone through many faces of shifting from one city to other like the Agra. However the court was finally brought back to the same town till today. Due to the fame the Allahabad court has gain over the years the court receives a lot of case each day. People appeal their case here if not satisfied with the ruling from the lower courts. 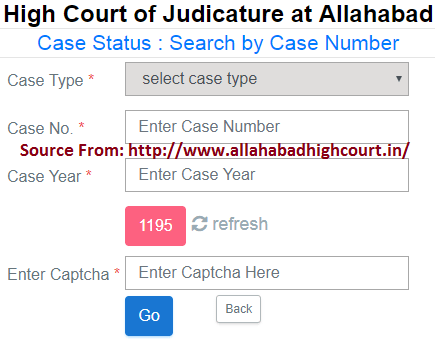 How can one check the Allahabad High Court Case Status by Case Number wise? This being a big court in the Uttar Pradesh state, you can only imagine how many cases they handle in a day. The court is busy and has sent out system for the citizens who have pending and ongoing case to check. Individuals will only need the legal details to gain access and the right document. We can check the status using the number of the case which is referred to as number wise. The page open up and displays details about the case and case status. 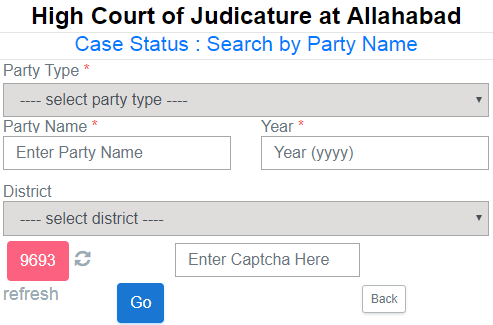 Go to the case type button and here select the case type like: AMAL-AMALGAMATION ORDER. Fill in the case number. Followed by the case year. On the screen check and enter the Captcha code. Recheck all the above details and on the left side there is the go button. Click on it to get the details of the case. Again we have another official way of getting a case and learning the status. Case owners will need the right details which have to be entered to give the case type. Give the party name on the section provided. Key in the year of the case. After this enter the district example the AGRA. Again enter the Captcha code on the screen. Right after the code a blue button written “go” awaits your clicking. Note you have the back button in case you need to repeat a certain step. The system will show the information about the case. This a legal procedure to search for the case status. Works first and also efficient. Direct go to the search by crime/ST number on the menu bar. We have the ST number and the crime number. Now fill in the crime number or just the ST number. Key in the year and the district. Enter the Captcha code and click on the go button if all the details are correct. The Allahabad High Court has given official rules about the cases which are heard and decide here. Before the court couldn’t not officiate a hearing date for petitions. They have worked to ensure they give best services by giving strict rules. The Allahabad High Court cannot leave any case undated. This good news for the petitioners since the court will giving official date online. Yes this a big step and has the backing and being officiated by the listing department. This has will take effect on 12th October. The court will remove the cause list in accordance to the course. The Allahabad court also has greater news and has come up with plans to list the cases from 1st July. Some of the cases are the petitions and appeals. It the duty of the petitioner to list the case a fresh in order to be considered. This will reduce the number of cases pending hearing. Some individuals have long term cases thus wasting a lot of time looking for petitions. The state government through the judicially will hear and make rulings and reduce this number. Amazingly you only need internet to have the case listed. What are the features of the new application? The last date of the case this was when the case was heard. What was the judgment or the order passed. Is there any urgency in the listing? The counsel’s name plus the enrollment number. Respondent and give all the information of their counsel. The state goes further in giving special attention to the senior citizens. They will fill in the same way but give enough evidence of them belong senior citizens. Follow same procedure as the old cases but give information about their advocates and lawyers representing them. This has created great order in the case hearing thus serving the citizens well and in a satisfactory manner. The Allahabad high court still taking the highest rank of best services to all citizens in the Uttar Pradesh state.